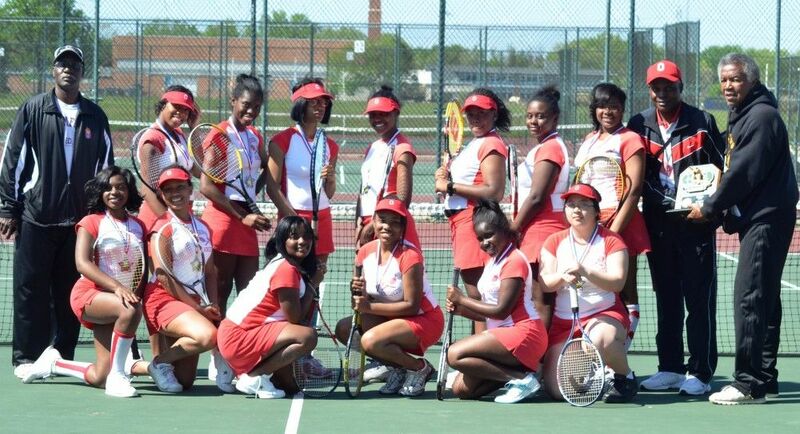 Osborn High won gold medals in seven of the eight championship matches to emerge with its eighth consecutive Detroit Public School League Division II girls’ tennis championship Friday at Barcus Tennis Center. Led by freshman Denae Williams’ 6-3, 6-0 victory against Central sophomore Elisha Lorick at No. 1 singles, Coach Rodney Wray’s Lady Knights scored 22 points to match the collective point total of Central and Kettering, which tied for second with 11 points. Northwestern placed fourth with six points followed by DIA with five and Cody with two. Southeastern and Pershing both were scoreless and Finney did not play. In addition to Williams, Osborn’s other singles winners were senior Diaz Givian, who defeated Central freshman Shianne Wilson 6-2, 6-2 at No. 3, and senior Alisha VanArsdale, who beat Kettering freshman Meyaire Reece 6-1, 6-0 at No. 4. Central freshman Antonia Bailey was the only player to break the Lady Knights’ stronghold on the gold, defeating Osborn junior Jania Daniel 6-0, 6-0 to win the No. 2 singles title. Osborn’s sweep of the four doubles matches included junior Summer Johnson and senior Brittany Costa, who defeated DIA seniors Ashley Dodson and Sierra Johnson 6-2, 6-1 at No. 1; freshman A’Jhane’ Moran and sophomore Demyra Dawson, who beat Kettering junior Dena Scott and sophomore Andrea Edwards 6-1, 3-6, 6-3 at No. 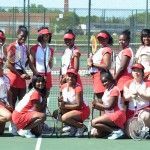 2; freshman Daishawn Dearing and junior Marcella Sims, who defeated Kettering sophomores Da’jia Walton and Jahmellia Jackson 6-1, 6-0 at No. 3; and junior De’Ja’ne’ Smith and freshman Kenyatta Dearing, who won by default against Kettering. All the medalists were accorded PSL All-City honors and their photos can be seen on the Detroit Public School League page on Facebook. This entry was posted in Girls, News and Press Releases, Sports and tagged 564, 565, 566, 567.